FrontLine Clubs is a discipleship program designed to train children to love and live the Bible. The FrontLine program teaches basic Biblical theology, starting with the attributes of God. FrontLine Clubs offer graded material for age 3 through sixth grade. 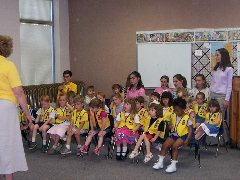 All clubs study age-appropriate variations of the same basic theme each week. Club material alternates between two full years of curriculum (30 weeks per year). Uniforms are practical, simple, and attractive vests and shirts. Awards include collar pins, patches, and medals, as well as Christian books and recordings kids love. FrontLine Clubs meet once a week with organized activities to fill approximately 90 minutes. Meeting time includes songs, Journal time, Bible story, games, and crafts. Every meeting activity is designed to teach and reinforce the weekly theme. 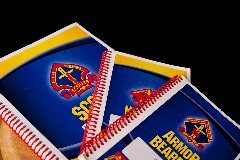 The "OPS" (Operating Procedures) provides leaders with a well-organized, comprehensive spiral-bound notebook of lesson plans, visual aids, record-keeping forms, and more. Clubbers use a take-home Journal workbook of Bible memory passages and five daily activity pages per week. The children go through two Journals per year, each containing fifteen weeks of material. The weekly Bible memory coordinates with the theme of each week's lesson. It consists of passages rather than scattered verses. All age groups memorize from the same passage each week. Young children learn just a phrase or short verse of the passage. Older children memorize more of the passage, and the sixth graders learn the entire passage of five or six verses. Every two years the same passages are re-visited, aiding life-time retention of the memorized verses.